So, is Facebook, Yahoo Mail, Netflix, or another big site refusing to load? 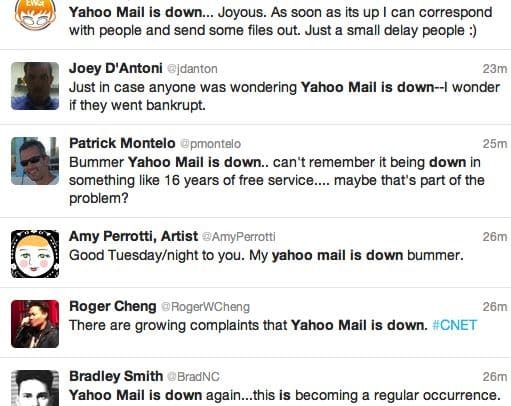 Well, maybe something’s wrong with your Internet connection; then again, your favorite site could be suffering from a server meltdown. Here’s a few ways to find out whether the problem lies with you, or them. One quick way to find out whether you’re the one with an Internet problem is to try visiting another web site. If Facebook isn’t loading, try Google, Yahoo, or any other site you can think of—and if it works, at least you know your Internet connection is still up. There are dozens of sites on the web that promise to tell you whether a given site is actually down, or it’s just you—and indeed, the most popular of them all is called downforeveryoneorjustme.com. Just plug in the URL for the site you want to check, press “Enter,” and you’ll get a simple, instant answer. Downforeveryoneorjustme.com and its many clones will check any site on the web, but don’t expect much in the way of details. 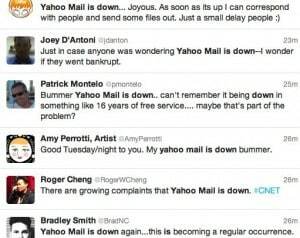 A rash of complaints on Twitter is a sure sign that you're not the only one who can't access, say, Yahoo Mail. A far more comprehensive site is Downrightnow.com, which tracks the status of more than a dozen major services including Facebook, Yahoo Mail, Gmail, Netflix, and Twitter. Downrightnow boasts a dashboard that summarizes the status of all the sites it checks, or you can click an individual site for a 24-hour status history. 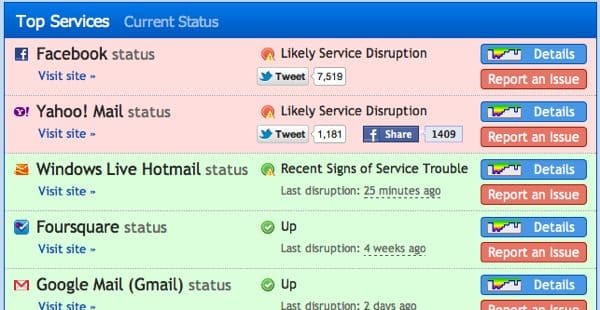 Several of the biggest web sites manage blogs and/or twitter feeds dedicated to detailing any status disruptions. Both Twitter and Skype have their own status blogs, for example, while Netflix and Yahoo have official status feeds on Twitter. Instead of a blog, Google has a dashboard that reports on the status of its various apps, from Gmail to Google Documents. Facebook, meanwhile, has an official “Known Issues on Facebook” page, although it won’t do you much good if Facebook itself goes down. Keep in mind that you’ll almost always find someone on Twitter complaining about a given site being down, especially if that site happens to be Facebook. The key, though, is frequency; if you search Twitter for “is facebook down” and get dozens of tweeted results from the past few minutes, chances are that something’s on the fritz.